humorous asides during the Notre Dame vs Navy game. CBS provided the television coverage of yesterday's Notre Dame vs Navy game in Dublin and the Irish people and the Irish government should be happy with what CBS provided. 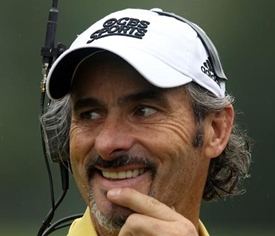 Oddly, the only questionable comments were provided by Irish emigrant David Feherty. Although I knew Feherty had made something of a name for himself on American TV as a golf analyst, I had never heard him before. I don't watch golf and didn't know what to expect from him. From his first contribution I realized that Feherty's role was to provide some humorous asides about football, about which he admitted to knowing next-to-nothing, and Ireland, presumably from an authentic Irishman's perspective. Unfortunately, he frequently got the tone wrong and was more insulting than humorous. During his taped half-time piece Feherty quipped that "it took me 37 years to escape this place and I still get a wee bit nervous at customs and immigration every time I come back in case they make me stay." I know he thought he was being funny, but it just across as far too negative. So negative, in fact, that The Gathering, the government's 2013 tourism initiative and prime sponsor of the game, could probably complain to CBS that Feherty had attacked the product they're selling. Also, I never before heard that famine immigrants sometimes lit fires on board ships that then caused the ships to sink. Maybe it happened - once or twice - but it made the "simple people," as Feherty called them, sound stupid. That was just Feherty and I really think it was more a matter of him trying too hard to be funny at times. I guess he didn't do too badly most of the time, but I could have lived without him. As for play-by-play man Lundquist and analyst Gary Danielson there can be no complaint. Both men were very generous in their comments about Ireland and the Irish. They got the tone right and Lundquist in particular was clearly charmed during his time in Ireland, at one point saying that although he's Scandinavian he'd like to come back for The Gathering. As for the images, CBS spliced in beautiful photographs of Irish scenery: the Cliffs of Moher, Bunratty Castle and numerous shots of Dublin. They made Ireland look great. The one glaring omission from the broadcast was a blimp. I presume CBS's budget for the game didn't stretch to a blimp, but The Gathering should have worked something out with them. The weather yesterday was great and blimp shots of Dublin and beyond would have been fantastic. Instead of blimp shots CBS used pictures from a camera mounted on a building somewhere along the Liffey and, frankly, those pictures got more and more dull as the game went on. A missed opportunity there. I have to admit I was somewhat surprised by the number of shots of fans drinking. I can't recall seeing so much of that during football or baseball games before. It seemed a like a bit of a stereotype, but of course most of the fans at the game were American, as were most of the drinkers. By the third quarter I was simply tired of it. Possibly the biggest negative from The Gathering's perspective was the score. A closer game would have been better as it would have ensured a bigger audience for the second half, especially considering that much of America was only waking up when the third quarter was getting under way. There was nothing that could be done about that, however, other than for Navy to do a better job of holding onto the football. As a total package, however, The Gathering has to be pleased. CBS delivered. * Yes, I fully understand all the background on Feherty and Gaelic games in County Down where he is from.